• There are 162 rooms and 17 suites. • Gresham Kavehaz restaurant and bar. • Some meeting and conference rooms, a Four Seasons spa, a fitness center and a small pool. 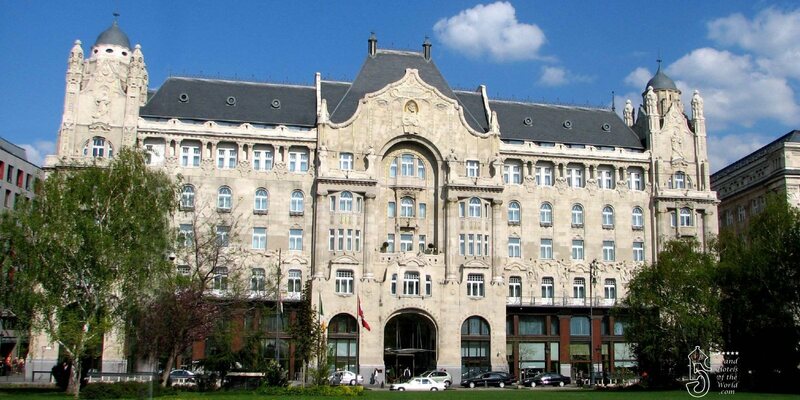 • This Hotel is located on the Danube river facing the Hungarian Parliament and the hills of Buda. • 1519: Birth of Sir Thomas Gresham, a british financier to Queen Elizabeth I. • 1848: Foundation in London of the Gresham Insurance company named after Sir Thomas Gresham. • 1827: Antal Deron, a Hungarian wholesale merchant comissions the architect Jozsef Hild to build the Nako House, a neo-classic palace. • 1880: Acquisition of the Property by the British Life Insurance Company Gresham. • 1903: Decision taken to settle the foreign headquarters of Gresham Insurance on the site. • 1904: The Hungarian architect Zsigmond Quittner designs the future Gresham palace. • 1905: Nako House is demolished and the new Greshma Palace erected. • 1907: Opening of the Greshame Palace as a prestigeous life insurance company building. • 1945: After World War II Soviet Soldiers reside in the palace. • 1948: Nationalization of the building by the Hungarian Communist Government. The palatial apartments gets subdivided into smaller flats. Gresham Cafe remains open. • 1976: The Palace gets listed as a protected monument. • 1990: Change of political system in Hungary, the Government transferred ownership of Gresham Palace to the District V Council. • 1991: Announcement of a Hotel deal with the Oberoi Hotel chain, but legal issues with the remaining 38 tenants of the building arised. • 1995: Oberoi Hotels lost patiance and withdraw from the project. • 1999: Disctict V Council, the Hotel Chain Four Seasons Hotels and Resorts and Gresco Investments Ltd signed a development agreement to restore the building to its former glory. • 2001: Acquisition of the property by Quinlan Private (later Avestus), an Irish Investment company. • 2004: Opening of the Gresham Palace as a Palace Hotel under the management of Four Seasons Hotels & Resorts. • 2011: November Oman State General Reserve Fund buys the property from Avestus (formerly Quinlan Private) for 75 million Euros. The Hotel remains under Four Seasons management.